Adam Aaronson has been at the heart of British studio glass for more than 25 years, both as gallery owner and artist. Adam specialises in free blown glass, and his work experiments with the hugely varied possibilities of the medium. His vessels and sculptures are at once a celebration of the simplicity of pure form, and also an investigation into the possibilities of layering. 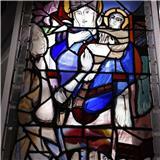 Bringing stained glass commissions to architectural reality is Peter's passion. From a domestic door panel to a large ecclesiastical window he puts all of his experience and artistic ability into creating artwork of beauty and purpose. Beautiful and original Stained Glass for sale and made to commission. Repairs also undertaken. With nearly 20 years experience in Stained Glass I provide a comprehensive service from the initial design process to the final installation. A member of the craft collective Firebrand Artisans Ltd, based in Shaftesbury, Dorset where visitors are always welcome to view our work. Argyll based glass artist, working with a mixture of techniques to create pieces of glass art. Ranging from small pieces of enammelled or fused jewellery to large Architectural instillations. Fused glass artist; Mark Briggs. Linear Art Studios continually break the boundaries of design to create stunningly unique and contemporary pieces of bespoke fused glass art. From his small but busy studio Lightworks Stained Glass, based in Clitheroe, Lancashire, Daniel creates bespoke stained glass of the very finest quality. I use several disciplines in a process to create glass laminate monoprints and paintings, including relief glass and plastic sculpture, and light photo-capture. I also make steel etching using traditional and not-so-traditional tools, including scribes, dremmels and angle grinders. 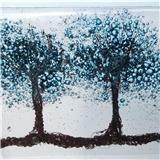 I work with kiln formed glass and my work varies between abstract wall art to small popular art. 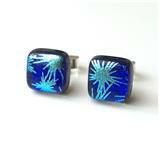 I also make fabulous fused glass jewellery. I can make any piece to order. I produce unique crystal portraits and other crystal artworks using Swarovski Elements. 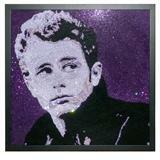 Each image consists of thousands of crystal rhinestones, which are individually glued into place to create the image. As light shines upon them, they continuously change appearance as they glisten. Totally unique in composition, no photo can really do them justice, but they are a stunning addition wherever they are hung. Much of my work is painted and fired and I love portraying animals, nature, folklore and Celtic weave. Inka Gabriel designs and manufactures contemporary lights working in the traditional copper foiling technique. By usin seemingly simple lines, she creates a fusion of the manmade or natural materials she uses in her designs with the sharp minimalism of white opaque or opalescent glass. Her lights not only give a focal point to any room but also create a wonderful calm light. Nina works with fusing, applique, sandblasting and traditional stained glass. Her work ranges from bespoke jewellery to large commission pieces for homes and gardens. Jonathan Harris is a studio glassmaker specialising in the ancient technique of hand carved cameo glass, glass engraving and bespoke Art glass designs worldwide. A traditianal stained glass artist in all aspects of stained glass work, my personal belief, commitment and underpinning philosophy in respect of my work, stems from the belief I have in the creativity of producing traditional stained glass, and what it offers as an agency for communication to the public. I make lamps, decorative mirrors, clocks, barometers, suncatchers and many other items using stained glass techniques (both leading and copper foil), glass etching and fusing and slumping. As an independent stained glass artist I specialize in unique Tiffany-style stained glass art. In the past seven years I have created windows, panels and sculptures using the Tiffany copper foil method. I have also been commissioned in a wide range of projects from Picasso, Van Gogh, Rodin and Henry Moore to Modern and Deco Art. We make Fused Glass Art pieces that are made in our studio in Shropshire. We recycle bottles into wine bottle clocks, cheeseboards as well as fused glass art coasters, wall hangings and clocks. Working with the medium of glass Anna also uses her site to promote and sell work from other glass artists to help support her. 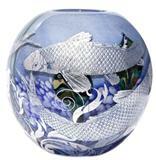 She is always looking for new UK hand blown art glass artists to promote if they fit the style and ethos of her site. 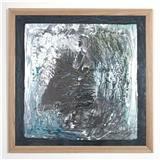 Nathalie founded her CouleurLive Studio in 1998 following The Journeymans Award by the Worshipful Company of Glaziers and Painters of Glass. Nathalie Hildegarde Liege works as an architectural glass designer and fine artist. Nathalie undertakes stained glass commissions for churches, as well as also undertaking, both private and public art commissions too. Antonia Macgregor specialises in designing and etching natural images into the surface of glass, creating unique, light enhancing mirrors, and light diffusing windows and screens to enhance and enliven interior and exterior spaces. Antonia works to commission, tailoring existing designs or creating new ones to suit individual requirements of size, dimension and setting. Sue's flameworked and kiln fired glass art work is full of vibrant colours. She produces wall display pieces, dishes, clocks and other wall work. 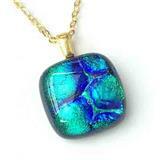 Her jewellery incorporates the stunning hues and reflections of dichroic glass. Line + colour + light. I design and make decorative pieces for home, garden, and corporate spaces in the form of wall panels or sculptures and each piece is unique. Panels are built up and can take several firings until complete and sculptures are made using hand made moulds from clay or wax models. Reflected light gives glass a quality that cannot be replicated in any other medium.